Jenny Jen42: Hamilton Fest this Saturday!!! 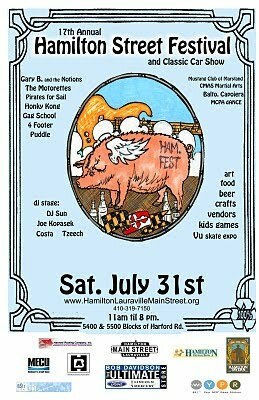 Hamilton Fest is this Saturday! !This will be my last summer gig! If you haven't seen the new and hip Hamilton you need to show up to see how hip Hamilton has become! Two of the best restaurants and hang out joints are there: Clementine and Hamilton Tavern. You'll people from all parts of your past! I love living so close to this area. So come on out. Its form 11-8 on Harford Road just north of Ecodale.Good food, craft vendors, cars, beer and music. And the weather looks like its gonna be in the 80's!!!! I'll be sharing a booth with my BEST buddy Danamarie from greenstarstudio.